Stimulated by the discussion at another entry, yesterday I made a little graph, almost a mnemonic, on the demographics of Northern European Neolithic and Chalcolithic, based on academic data which I discussed back in 2009. The very simplified graph is nothing but a version of another one, used in 2009 (and reproduced below), which in turn is an annotated and composite version extracted from two different studies (references also below). For convenience I have marked the millennia marks at the bottom (meaning 5000, 4000, 3000 and 2000 BCE, from left to right) while the unmarked vertical scale ranks from 0 to 100 (marked by the lowest and highest dots, not the frame, which is actually outside of the graph itself). The dots mark population level at any time as proportion of the maximum (100) in discrete intervals rounded up/down to 10 ppts and taken at intervals of 250 years. Notice that I ignored monuments in the case of Britain, only considering the habitation and other productive sites. Not sure if it will result useful to you but it did help me to visualize the demographics of Northern Europe in these four millennia of surely dramatic population changes. If you don’t like this version the more detailed original double graph is below, scroll down. Something quite obvious is that while Danubian Neolithic first caused an important population expansion, it later declined to quite low population levels, maybe because of climatic cooling and the exhaustion of the lands because of poorly developed agricultural techniques. 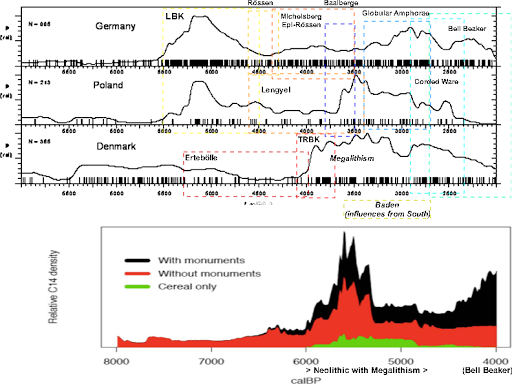 This late Danubian collapse lasted for about a millennium, when (1) Funnelbeaker (TRBK) in Denmark, (2) Megalithism in Britain and Denmark especially (later also in parts of Germany) and (3) Kurgan cultures in Poland (later also in Germany and Denmark) seem to have brought with them very notable demographic expansions. But decline seems to set on again all around at the end of the Chalcolithic period, much more notably in the continent (in Poland the rate of archaeological findings decays to zero!) than in Britain and especially Denmark. S. Shennan & K. Edinborough, Prehistoric population history: from the Late Glacial to the Late Neolithic in Central and Northern Europe (Journal of Archaeological Science, 2007). Mark Collard et al., Radiocarbon evidence indicates that migrants introduced farming to Britain. Antiquity, 2009. Human intelligence not really linked to frontal lobe. New research highlights that the human frontal lobe is not oversized in comparison with other animals. Instead the human intelligence seems to be distributed through all the brain, being the network what really matters → Science Daily. 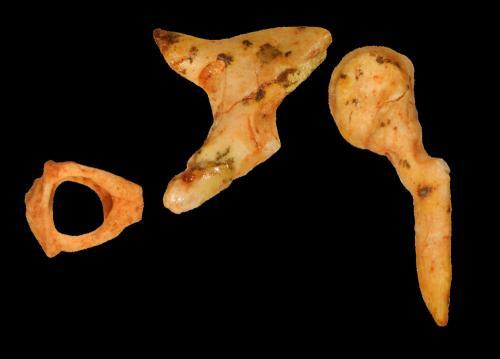 Early hominin ear bones found together in South Africa. The three bones, dated to c. 1.9 Ma show intermediate features between modern humans and apes → PhysOrg. New hominin site in Hunan (China). The sediments of Fuyan cave, in which five human teeth (Homo erectus?) were found, along with plenty of animal ones, are dated to 141,700 (±12,100) years ago. → IVPP – Chinese Academy of Sciences. Neanderthal workshop found in Poland. In Pietrowice Wielkie (Silesia), which is at the end of a major natural corridor from the Danubian basin → PAP. Ancient Eastern Europeans ritually killed their pets to become warriors. In the Bronze Age site of Krasnosamarkskoe (Volga region, Russia) more than 50 ritually pieced skulls of dogs have puzzled archaeologists, who have reached the conclusion, after researching Indoeuropean accounts from India, that the animals may have been killed in adulthood rituals: the boys who were to become warriors had to kill their most beloved pet in order to be accepted as such, and did so in a precise and macabre ritual → National Geographic. Ancient log boat found in Ireland. In the Boyne river, which was in the past a major artery of the island. Not yet dated: it could be from prehistoric times or the 18th century. → Irish Times. As they do regularly, the people of Stone Pages bring us some archaeological news from around the world. 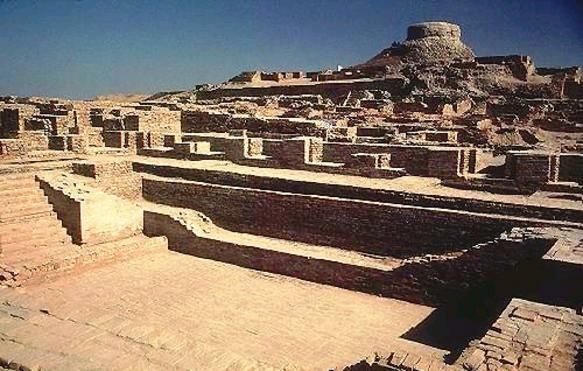 Most interesting to me this time is that, according to Elle Rogersdotter, one of every ten artifacts at the intriguing Indus Valley Civilization, the first civilization of South Asia, was for fun, including dice and gaming pieces. The magnificent civilization, unlike others of its kind, does not include anything that can be interpreted as a temple or palace, confusing researchers used to think that elites were necessary for social organization. However other early civilizations of West Asia (Jericho, Çatalhöyuk) were also classless it seems.